1. In a medium bowl, mash the 1 1/2 pints berries with the sugar; let stand for 10 minutes. Stir in 1/2 cup water, then strain into a large pitcher, pressing with a spoon to extract any juice. Stir in the lemon juice and 2 1/2 cups more water. 2. Fill 8 pint glasses halfway with ice. 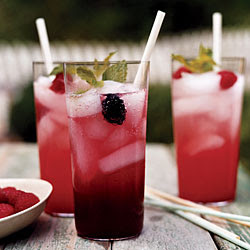 Pour about 3/4 cup berry-lemon mixture into each glass, top with a splash of seltzer and stir to combine. Garnish with berries and a mint sprig.